Feta. Do you love it? I just started enjoying it last year. I know… I’m a freak of nature. I also just started enjoying most cheeses within the past 10 years of my life. For the most part my hips were thankful of that. I had been dreaming up Greek Crostini appetizer for quite some time now, when it hit me one day as I was purchasing feta from the store. The container of feta just so happened to be a buy-one-get-one free deal. So, I picked up a regular container and a garlic & herb container. I figured I could do something with it. Fast forward about a week later when I was putting together appetizers for Easter dinner. I made my mini crab cakes and I wanted to bring something else for those who might not enjoy crab cakes (which baffles me, but for each is their own). That’s when it hit me. Smear this creamy Garlic & Herb Whipped Feta spread onto a crostini. Get ready… because you’ll be addicted to this spread. Whether you choose to add it to your next appetizer or smear it on to a bagel. 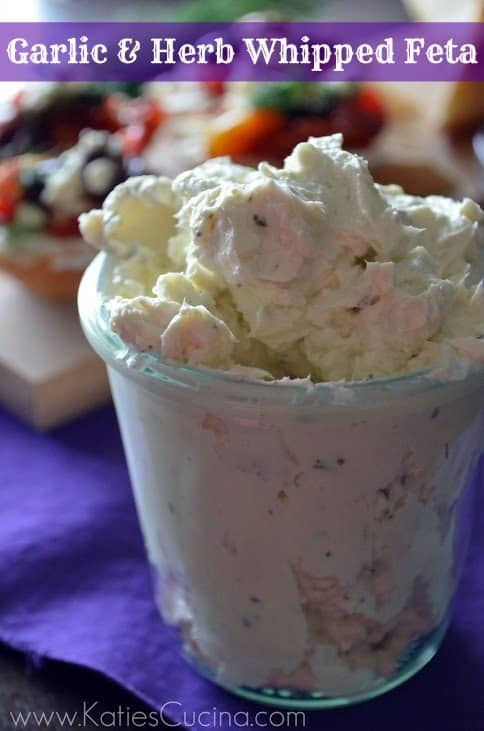 The flavors from the feta combined with fluffy whipped cream cheese will bring your taste-buds divine joy! In a stand mixer using the flat beater blade, add the cream cheese (at room temperature) and mix on medium speed for 30 seconds. Then add the feta with garlic and herbs to the bowl and beat for an additional 30 seconds. Use right away or place in a sealed container and store in the refrigerator for up to 1 week. It’s official: I want to slather my life in this stuff. They pair perfectly! As a Greek I just love feta! Oh YUM!!! I love feta!! Awe thanks Brandy! Not gonna lie… this stuff is pretty addicting!